Since 2015, a creative momentum project has worked to support the development of the creative economy across the five project regions in Europe’s northern edge. But we are also concerned with influencing creative sector development beyond the project’s lifetime. We are gathering evidence to help shape future policy and support programmes. One part of this work is carrying out an economic impact assessment of the creative sector in each region. To do this we need your input. 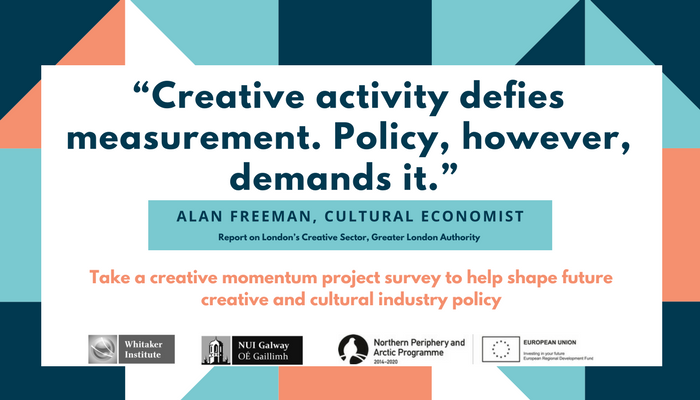 We’ve designed a survey to gather data on the sector’s value and need enterprises, freelancers and organisations active in the creative economy to complete it. Policy is increasingly driven by research and evidence. Creative industries are dynamic and a resilient sector. But more evidence is needed clearly demonstrating this. The findings of this survey can help raise the profile of the creative sector in your region. The creative sector takes a unique form in different places. The data we collect will help build a more reflective picture of the sector each region. The most effective local policy measures are tailored to local strengths and needs. Creative industries are generally concentrated in core urban areas. To effectively compete, the creative sector in peripheral regions must do so with an awareness of this wider context, but also play to their own regional strengths. Some sub-sectors of the creative economy could be more suited to peripheral regions than others. We need to build a clear baseline picture of the sector to better understand if some sub-sectors have more growth potential than others. Not all sub-sectors of the creative economy bring the same local development impacts. We aim to provide policy makers with evidence that can help inform evidence based policy focused on the impacts they wish to stimulate. For example, core creative arts may have more socio-cultural development impacts, while creative technology greater job creation potential.